The Great Western rail line has a set of 4 tracks: 1 set main out of London, 1 set main into London, 1 set relief out of London and 1 set relief into London. The main lines carry fast trains along the route, the relief tracks carry slower stopping services. 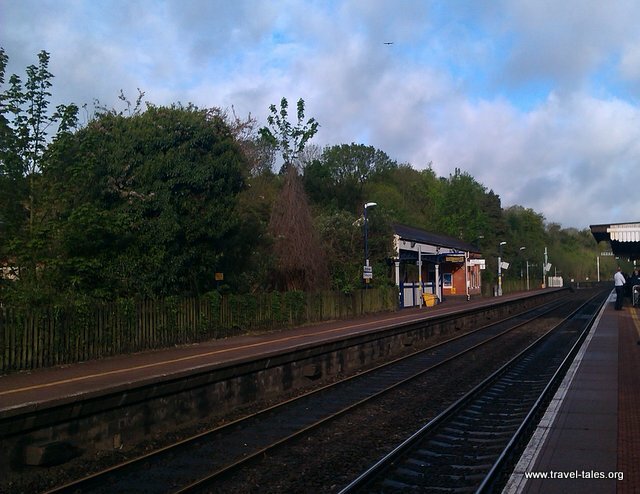 Pangbourne is one of the slow stations and plenty of fast trains go whizzing past. During commuting times there are semi-fast trains which stop at all the slow stations before Reading and then go fast to Maidenhead and then on London (and vice versa in the evenings). I aim to get these trains because I can get a seat on my way in and dose as the train travels into the sunrise. Most stations along the route have 4 platforms, one for each set of tracks. For some reason, Pangbourne does not. So in the event of engineering work closing the relief lines, trains don’t stop at Pangbourne. During Building a Greater West unfortunately this is happening quite a lot! Over the Easter weekend lots of routes were not running and in the week after Easter Pangbourne station was closed all week. Tickets were accepted up to the next station along the line Goring, so for a week I got to wave at my house as I passed it on the train to and from work. The station building dates from the reign of Queen Victoria, which you can tell by the letterbox which is set into the building. The VR at the top stands for Victoria Regina. More recent letter boxes have a ERII at the top for Elizabeth Regina II.